Access Router Strategy version 1. This strategy is designed for the last hop on the NDN testbed, where each nexthop connects to a laptop, links are lossy, and FIB is mostly correct. Multicast the first Interest to all nexthops. When Data comes back, remember last working nexthop of the prefix; the granularity of this knowledge is the parent of Data Name. Forward subsequent Interests to the last working nexthop. If it doesn't respond, multicast again. Definition at line 47 of file access-strategy.hpp. Definition at line 36 of file access-strategy.cpp. Definition at line 52 of file access-strategy.cpp. Definition at line 59 of file access-strategy.cpp. 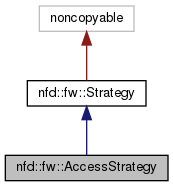 References nfd::fw::RetxSuppressionFixed::decidePerPitEntry(), nfd::fw::FORWARD, nfd::face::Face::getId(), nfd::fw::NEW, NFD_LOG_DEBUG, and nfd::fw::SUPPRESS. Definition at line 214 of file access-strategy.cpp. 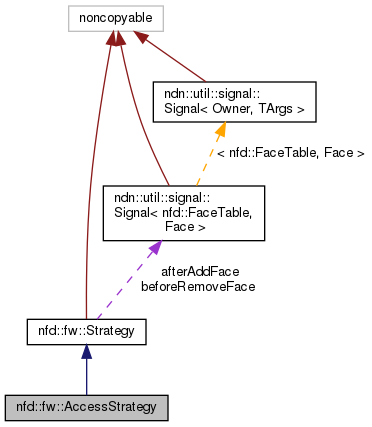 References nfd::face::Face::getId(), NFD_LOG_DEBUG, and ndn::time::steady_clock::now().